When I chose a vegan lifestyle I did not anticipate the number of questions I would get from strangers and new friends regarding my choice in eating habits. I honestly thought it was a simple personal decision. Yet at times I feel like I have a huge V stuck to my forehead. V for Vegan! If you talk to the majority of vegans they will tell you that they live this lifestyle because of concerns they have for animals. Animal welfare is a huge movement behind the popularity of the vegan diet. However, as usual I do not fall within the majority of this movement. My family and I care for animals and their well being but their welfare has zero, zilch, nada to do with out decision to remove all animal proteins from our daily diet. Plain and simply, I am a vegan for my personal health and well being. As I’ve stated previously, I’ve never been a huge meat eater but certainly never gave it much thought as to what the red meat, lean proteins, dairy, and eggs were doing to my overall health and long-term cancer risk. I also never even considered that animal protein sources, more specifically casein, might be the cause of my overall tiredness. When was the last time you stopped to truly and honestly consider the foods that you put in your mouth each and every day? Do you give a second thought to how these foods are affecting your body, your mood, overall health, long-term health? Or perhaps you have a chronic disease, maybe an auto-immune disease, did you know that animal proteins can be the cause of your disease? The research is too vast and extensive to even skim the surface appropriately in this short article. Do the research yourself, don’t just take my word for it. Educate yourself about the effects that animal proteins have on your body. I would suggest starting with the two leading books in the vegan scientific community, The China Study and Whole both by T. Colin Campbell. You truly owe it to yourself and your family to research an plant based diet and the benefits it has on your longterm health. Did you know that the length of our intestines indicates we are best suited for a diet based in plants and protein sources other than from animals? This article provides a great comparative analysis of carnivores, omnivores, and herbivores. I choose to live a vegan lifestyle for my diabetic husband. 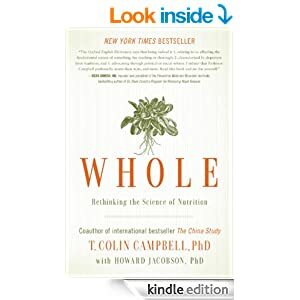 In reading The China Study and Whole, it became very apparent from all of the scientific research Campbell presents that a vegan lifestyle could dramatically benefit my husband who lives with type-1 diabetes. Through Campbell’s research and life experiences he has seen a huge improvement in insulin dependent diabetic patients that live a vegan lifestyle. My husband is very aware of the long-term effects that his diabetes can and most likely will have on his long-term health and well being. With in 24 hours of starting to eat a vegan diet my husband noticed an effect on his insulin needs. Almost immediately he no longer needed as much insulin with each meal. Now months later he is taking 10 times less insulin per day than he was when eating a conventional diet full of animal protein sources. Not only is this a huge boost to his health but it helps our financial bottom line in that we aren’t purchasing insulin as often. It took some time for him to figure out his new insulin needs but he is so stable now that he can go without insulin for a meal if he eats clean. Additionally, he regularly sees his blood sugar levels decrease overnight rather than increase as is the case with diabetics. This result shows that his pancreas is healing and starting to produce insulin on its own and can keep up with the fast that occurs while my husband sleeps. He feels better and has more energy than when he was 20 years younger. He is a long distance runner and regularly runs seven plus miles with 10+ mile runs once or twice a week. I choose to live a vegan lifestyle for my health and the health of my family. Why are you vegan? Or why aren’t your vegan?